The League of American Orchestras' Volunteer Council leads, advocates, and champions volunteer organizations in their efforts to support their orchestras' community outreach and civic partnerships to advance the experience of orchestral music. Happy New Year from the League of American Orchestras Volunteer Council! The year's beginning signals a chance for new goals and resolutions. One resolution I strongly suggest for you and your volunteer organization is to attend the League's National Conference in Chicago June 12 - 15. The Volunteer Council has been hard at work to roll out the red carpet for you and to make sure you get "a bang for your buck." The benefits are priceless. We will collectively find solutions to common problems; listen to the Chicago Symphony Orchestra under Zell Music Director Riccardo Muti with guest artist Yo-Yo Ma, CSO Judson and Joyce Green Creative Consultant; hear volunteer ideas especially for you; and share a meal at fine dining experiences while networking with attendees from across the country. Plus lodging and meeting sessions are all under one roof, at the historic Palmer House Hilton, several blocks from a number of Chicago cultural landmarks. Our mission goes hand and hand with the League's mission: to advance the experience of orchestral music, support the people and organizations that create it, and champion the contributions orchestras make to the health and vibrancy of communities. At the Chicago Conference, we will confirm, connect, and celebrate our work. In this issue, please see Volunteer Council Conference Chair Camille Williams' article on more helpful details, Sarah Good’s article on the incredible city of Chicago and Linda Stevens’ article on the wonderful Gold Book projects which the winners will present at Conference. Consider this Conference opportunity as our gift to you, for all you do for your orchestras. It is a New Year's resolution that will keep on giving many times over in future benefits for your organization. Looking forward to seeing you in Chicago. Join us in June for the League's National Conference and engage in its theme, stay at the historic Palmer House, attend a concert of the world-class Chicago Symphony Orchestra, and absorb many ideas to take back to your home volunteer organizations. The beautiful, historic Palmer House, a Hilton hotel just off Michigan Avenue, will host both lodging and Conference sessions. 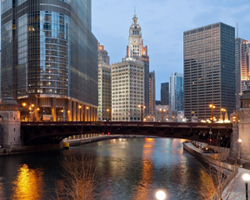 Its location is an easy walk to notable sights such as Millennium Park, Symphony Center, the Art Institute, the theater district, restaurants, and shops. Highlights include a performance of the world-class Chicago Symphony Orchestra under the direction of internationally acclaimed Maestro Riccardo Muti. The concert will feature special guest artist Yo-Yo Ma performing Shostakovich Cello Concerto No. 2. And you won’t want to miss Artistic Director and Principal Conductor Carlos Kalmar, Chorus Director Christopher Bell, and the Grant Park Orchestra and Chorus for opening night of the Grant Park Music Festival 2018 season in the Frank Gehry-designed Jay Pritzker Pavilion in Millennium Park. Those of us on the Volunteer Council are planning stimulating Gold Book and Roundtable award presentations pertinent to your efforts in reaching diverse and under-served communities, and implementing new fundraising and new member strategies. You will have time to compare notes while networking with fellow volunteers. In addition to volunteer sessions, you can attend the League's many elective offerings. *Please note that the main dates of Conference, June 13-15 are a Wednesday through Friday. Additionally, there will be pre-Conference volunteer activities beginning on Tuesday June 12, 2018, so plan to arrive on Monday or Tuesday morning so you do not miss these opportunities. Chicago Symphony Orchestra - Maestro Riccardo Muti always reminds us how lucky Chicago is to have such fine musicians and singers available for us to hear. Don’t miss an opportunity to hear this great orchestra play at Symphony Center. Did I mention the guest artist that week is Yo-Yo Ma? Top Chefs - Rick Bayless (Topolobampo and Frontera Grill); Tony Mantuano (Spiaggia); Stephanie Izard (Girl and the Goat and Little Goat Diner), and so much more. My family loves the ribs at Twin Anchors but you can’t go wrong with any other cuisine in the city. There are great steak houses, pizza, Chinatown, Italian. You name it, this city has it. I encourage you to explore the many options. Magnificent Mile - Starting at Oak Street on North Michigan Avenue and going south for one mile to the Chicago River, you will have plenty of places to shop. Architecture - So many great buildings to see by Wright, Sullivan, Burnham, Miles, Gehry, Mies Van der Rohe, and more. Chicago offers both walking tours and boat tours as a way to experience some great architecture. Theater - Not only do we offer Broadway shows (Broadway in Chicago) but we also have plenty of great hometown theaters like Steppenwolf, Lookingglass, Chicago Shakespeare, etc. Millennium Park - This is Chicago’s #1 tourist attraction and offers beautiful gardens, fountains, music, and the famous “Cloud Gate” sculpture (also known as “The Bean”). Baseball - Not one but two teams to choose from – the Chicago White Sox and the Chicago Cubs! Lincoln Park Zoo - Our “Ark in the Park” is located north of the city and is quite beautiful! I recommend stopping for lunch or dinner at nearby RJ Grunts for a great bowl of onion soup with their wonderful salad bar. They offer great burgers and other items, too. The New Riverwalk - An open, pedestrian waterfront on the south bank of the Chicago River in downtown Chicago that spans from Lake Shore Drive to Franklin Street. Called the city's 'Second Lakefront', the Riverwalk contains restaurants, seating, boat rentals, and other activities. Museums - So many to choose from! 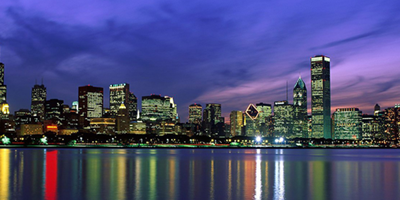 The Art Institute is directly across from Symphony Center and a short walk from the hosting hotel. The Field Museum, Shedd Aquarium, and Adler Planetarium are close together in a campus-like setting. These three museums can be accessed via public transportation or a short cab ride. You can even walk to them if you wanted to get some exercise. Other museums available are our Museum of Science and Industry, Museum of Contemporary Art, and the DuSable Museum of African American History. There are so many other things to see and do. Like hearing some amazing blues and jazz music, heading to the top of the Hancock or Willis Tower, or taking a walk along the lakefront. Please don’t miss this opportunity to visit the great city of Chicago and to experience the amazing League of American Orchestras Conference. This year’s Gold Book Award of Excellence winners includes projects that reach diverse and under-served communities, implement new fundraising ideas, and recruit new members. Eight projects will be recognized and presented by volunteers to volunteers at the League of American Conference next June. These projects were selected from submissions on the Volunteer website www.goldbookline.org and evaluated by Volunteer Council members. Enjoy a thumbnail sketch of each project to get a glimpse of what you will learn in Chicago from these award-winning project presentations. The following are listed in alphabetical order by symphony name. Congratulations to each Award of Excellence winner; we look forward to hearing details about your project in Chicago! The Guild had established a new fundraiser in 2014 which was successful, but they wanted to increase the net revenue. Adding a Silent Auction was the answer. The mechanics of planning a silent auction, volunteer roles, and community engagement were critical in achieving their goal. The Friends’ goal was to raise awareness of the Grand Rapids Symphony by embracing the youthful spirit of the city’s dynamic leadership. They chose a unique event appropriate for children by partnering with Blandford Nature Center to reach adults ages 30-40 with children. The event evolved as young professionals joined in the planning and volunteered ideas and support. They successfully reached over 1,300 people and developed new community partners. The Guild’s goal was to host a new fundraiser that increased visibility of the orchestra in the community. Using inspiration and ideas from another volunteer organization, the "Lavender and Lemons Kitchen Tour” was established. Seven recently remodeled kitchens in new and historic neighborhoods were secured for the tour. Special events in each home carried out the Lavender and Lemons theme. They received numerous new business sponsors and raised visibility for the orchestra with the people taking the tours. The 15th anniversary of the orchestra provided an opportunity to reach a rapidly growing segment of society with a special concert for seniors at their retirement home. These retirees were looking for entertainment options within their retirement facilities, which often have excellent accommodations for performances. Learn how a community orchestra expanded its patron base with these special concerts and provided opportunities for growth. This unique project provided a rich music learning experience for pre-K, kindergarten, and first graders in the inner-city, under-served public schools. The Friends went “on the road” with a focus on integrating music and literacy while bringing elements of classical music and knowledge of what it means to be an audience. Assessment tools were used to measure success, and the results were impressive. The Associates needed to increase membership to facilitate their ongoing fundraising commitment to the Spokane Symphony. They created a new game entitled “Music Bingo for Membership” to introduce potential members to the Symphony Associates and learn about their projects. A two-hour party was held in a local, historic winery which featured the proven elements of good food, wine, and fun resulting in several new members and making new friends. The Guild volunteers wanted to elevate fundraising by designing a fun event in which the community would support and participate annually. Using a new theme, “A Night in Paris,” based on all things one would experience in Paris, they established synergy between the Utah Symphony, the Symphony Guild volunteers, local businesses, and social and arts communities. These relationships were instrumental in achieving a higher level of giving and a commitment by the community to repeat the event next year. When Elizabeth Connor Stewart moved back to her hometown of Charlotte, it was only natural that she joined The Symphony Guild of Charlotte. Involvement with the Guild and Symphony is a family affair! Her mother has been a Guild member for over 30 years and both parents have served the Charlotte Symphony as board members and trustees. “I grew up with the Guild helping my mother at Showhouses,” said Elizabeth. Soon after becoming a Guild member in 2012, Elizabeth joined the Guild Board; first as Vice President - Fundraising (2016-17) and the next term (2017-18) as Vice President - Management and Planning where she was involved with budgeting, financials, bylaws, and other administrative matters. Mission Matters - Millennials have to care about the mission of an organization before they will get involved. Making your mission front and center in all that you do will go a long way to attracting this audience. Don’t Forget About Me - Millennials also want to see the value of volunteering and belonging; they want to know what they will get out of association with the organization. Socializing is the Secret Sauce - Millennials are networkers. When you can bring socializing together with volunteering you increase your odds of engaging and retaining them as members. Never underestimate the power of a social component—food and drink—to build community! Social Media is a Must - Millennials are digital natives. Online presence (Facebook, current website) is expected. Make sure your presence is regularly refreshed and updated. Affordability is Key - Millennials earn 10% less than comparable generations. This is something to consider in structuring membership levels or in pricing events members are expected to attend. This engaged volunteer doesn’t know what her next role with The Symphony Guild of Charlotte will be once her current term is up, but she knows she’ll stay committed to supporting her hometown symphony. You are invited to join the Volunteer Council’s Facebook page to network with other volunteers across North America. This is a closed group that provides space to share ideas, ask questions, and chat with friends that you have met at the League Conference. The more volunteers use the site, the more valuable it becomes, so jump in and socialize! You will be asked your name and your volunteer organization and then a member of the Volunteer Council will accept your request. The Volunteer Council is assisted by our incredible Sustainers who have served previously on the Volunteer Council. This year, we invited Sustainers in and around the Chicago area to join us for lunch and a Chicago Symphony Orchestra (CSO) matinee concert. 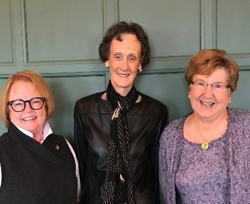 We were thrilled to welcome JoAnne Krause, right, (Class of 1993, President 2000-01) who took the train from Milwaukee, and Penny Van Horn, center, (Class of 2001, President 2008-09), a Chicago resident. Here we are, happily smiling in anticipation of a wonderful CSO concert (Linda Weisbruch on the left). Help the League Celebrate its 75th Anniversary - Win a Registration to the 2018 Conference! The League of American Orchestras, founded in 1942, is celebrating 75 years as the only national organization dedicated to advancing the orchestral experience for all. To recognize this important milestone, the League would like to invite the participation of our members. There are a few ways to participate—outlined below. And if you participate in any of these ways, you or someone in your organization will be eligible for a drawing for one of five 75th Anniversary Scholarships to attend our 2018 Conference in Chicago in June. (Eligible individuals are those who have never attended the League's Conference before.) Also, you or your orchestra or organization will be listed, and linked to, on the League's website as a "75th Anniversary Supporter." Feature the League's logo, designating your membership, on your website —in the "About Us" section, if not on your home page. Link the logo to the League's website. Also consider using the logo in your newsletters, program books, and other publications. Find member logos such as the one above at www.americanorchestras.org/75. Include an ad in your orchestra's program book about the League. The League can supply the artwork based on your specifications. Place a tribute ad in Symphony magazine or The Hub congratulating the League on its 75th anniversary. Create a video or write a short anecdote about how the League has helped you, your orchestra, or your organization. This would be featured in a section on our website on the anniversary. See examples and learn more for any of the above at www.americanorchestras.org/75. Thanks for your consideration! Your Volunteer Council works to bring together the best ideas, best projects, and best practices from volunteers around the country to share with you at Conference and through various resources.